You'll be £25.00 closer to your next £10.00 credit when you purchase Sniper of the Skies. What's this? When asked to conjure an impression of the 'typical fighter pilot', you may be inclined to think of the confident, extroverted, gregarious type, rallying his men and flying in the pursuit of victory. George Frederick 'Screwball' Beurling, DSO, DFC, and DFM, certainly achieved more victories than most typical fighter pilots dream of, but in temperament, personality and style, he was a one-off. A devout Christian, teetotaler and non-smoker, Beurling wasn't to be found patronising the local bars with his fellow pilots. Instead, he committed himself solely to the art of aerial combat. His very first missions saw him pursuing lone German fighters that he ultimately destroyed. He was determined to retain focus, noting how the men who did indulge had much briefer and much less effective tours. In Maltese skies he really came into his own, shooting down 27 Axis aircraft in just 14 days. In the month of July 1942, he secured five 'kills' in just four days. In the process he was awarded the DSO, DFC and DFM, along with hero-status amongst his fellow pilots and members of the public. He survived the war, only to be killed three years later whilst landing a transport aircraft following a test flight. 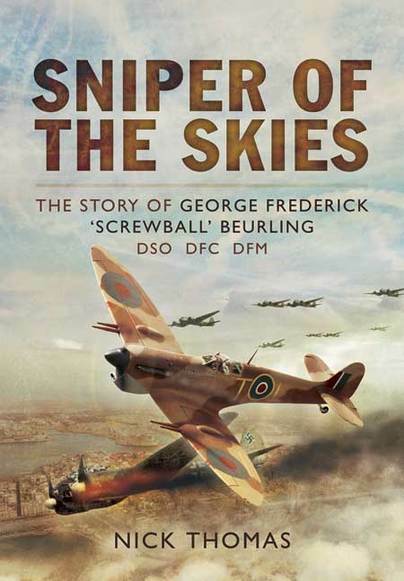 This biographical study serves as a tribute to one of the most successful and intriguing fighter pilots of the twentieth century, and should appeal broadly to fans of the genre. For someone with a special interest in Malta, the book provides much. There is a lot going on here and the breathless descriptions of air combat and rescues at sea really work for me. Mr Thomas has done a first rate job and I hope his book does well. He has latched on to a man who deserved having a balanced and respectful biography for the modern reader. This is that book. It will do much for patriotic Canadians as well, but we should all admire George Frederick Beurling wherever we happen to reside. He was the real deal.